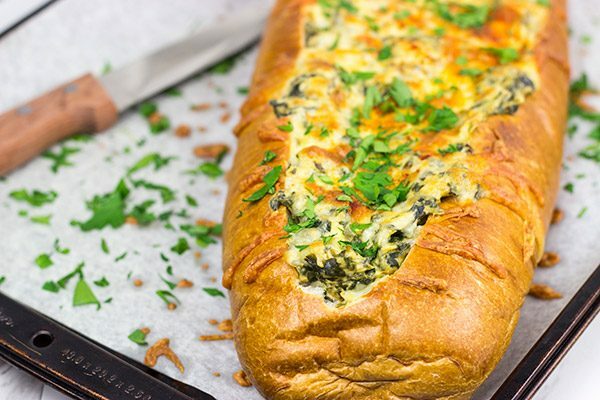 This Spinach Artichoke Stuffed French Bread is a tasty appetizer to serve while watching your favorite sport on tv! However, playoffs are different. Playoffs mean the end of the season for one team. Playoffs mean the chance at a championship. Playoff games mean something! So as we head into pro baseball playoffs and the World Series, I figured we’d look back at some of the best ballpark foods of the year. Oh, wait, did I say best? I meant worst. Globe Life Park in Arlington, Texas has been offering a 2-foot long hot dog for several years now. That bad boy comes with it’s own carrying case so you can get it back to your seat. As insane as a 2-foot long hot dog sounds, it’s still a hot dog. But this year, they’ve been selling what they call the Texas Snowball. Snowballs sound tasty, right? Well this snowball is actually a ball made from smoked brisket (yum! ), dipped into funnel cake batter and deep-fried (maybe yum) and then dusted with powdered sugar (that’s it. I’m getting off this train.) Since when is powdered sugar combined with smoked meat a good idea? To be fair, the Texas Snowballs have received at least some positive reviews…but I’m still skeptical. Continuing our tour of terrible ballpark food, let’s head up to Philly. Citizen’s Bank Park in Philadelphia has been offering a 9-patty cheeseburger this season. 9 patties! That’s 9 meals right there! And it clocks in at a measly 5,100 calories. Seriously? Who thought this would be a good idea? And now we’re off to Seattle. Safeco Field in Seattle has been selling toasted grasshoppers. Yup, grasshoppers. And what’s more? They’ve been selling out! They actually sold out of toasted grasshoppers for the first 3 games this season, and that prompted order limits. The grasshoppers are toasted and then tossed in a chili-lime salt…and they sold 18,000 grasshoppers in the first weekend of the season. Yum, yeah. I know folks eat toasted grasshoppers…but that’s not my thing. Let’s bring this discussion back around to something a little more normal, shall we? 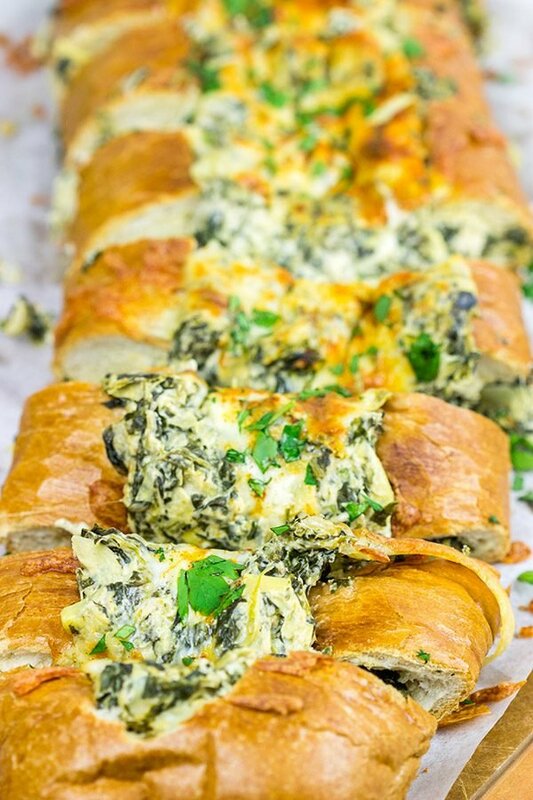 Like this Spinach Artichoke Stuffed French Bread. I mean that sounds crazy, but not near as crazy as eating 9 hamburgers or smoked brisket covered with BBQ sauce and powdered sugar. 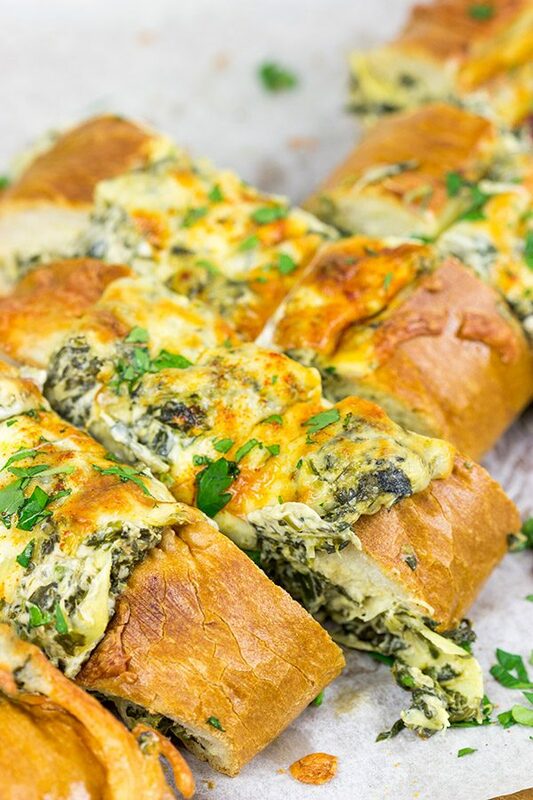 This Spinach Artichoke Stuffed French Bread is the perfect food for watching baseball playoffs at home! (Or college football games if you’re like me.) This bread is pretty much the classic dip (heck, it IS the classic dip) just served in a toasty loaf of French bread rather than with tortilla chips. 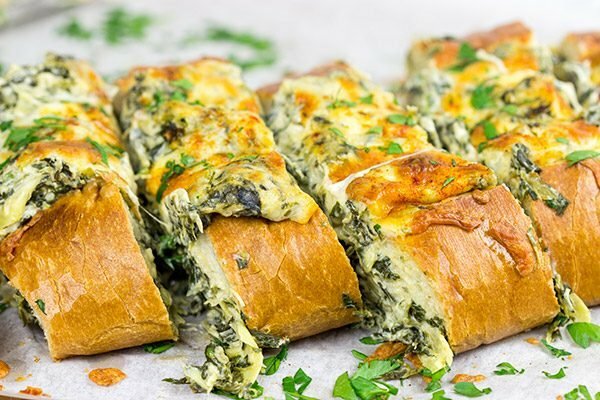 For this Spinach Artichoke Stuffed French Bread, I made my go-to spinach artichoke dip. I then stuffed that dip into the middle of a store-bought loaf of French bread. (You don’t need anything fancy here. I picked up a $1 loaf at our grocery store.) 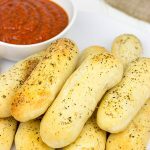 Let that bad boy bake in the oven for a bit until the cheese is all gooey and the bread is lightly toasted, and you’ve got one amazing appetizer! Laura and I actually ate this for dinner one night. Chips and dip for dinner sounds ridiculous. But Spinach Artichoke Stuffed French Bread? Not ridiculous at all! 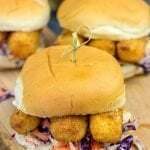 And if any ballparks are out there reading this, I highly recommend adding this to the menu next season! Would you get toasted grasshoppers at a baseball game? Cook the spinach according to the instructions on the package. Once cooked, press the spinach into a colander to drain out as much water as possible. Set spinach aside. Using a large sauté pan, add olive oil and place over medium heat. Once hot, add onion and garlic; cook for 4-5 minutes, stirring often. 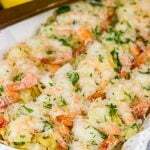 Add lemon juice, Parmesan cheese, sour cream, cream cheese, diced artichokes, salt, paprika, ½ cup of Monterey Jack cheese and drained spinach. Reduce heat to medium-low and continue cooking until mixture begins to simmer (~5 minutes). Cut a large wedge out of the top of the loaf of bread. Pull out additional bread from center to create space for dip. Spread dip into the loaf of bread. Sprinkle remaining cheese evenly over top. Let bread cool for 5 minutes before slicing. David! This little old absolutely divine. And, you would not believe how much baseball (Cubs) we watch around our home! My bf catches almost every game, so he’s, I’d say we are a baseball household 🙂 Go Cubbies!! Sorry for my typo! 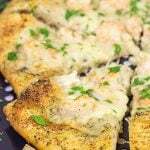 This recipe looks absolutely divine! Take care! Haha! No problem at all, Katherine! It’s that time of the year…baseball playoffs! 🙂 And that also means it’s time for delicious appetizers. We’re not a huge baseball house here, but I do watch the playoffs. Now college football? That’s another story! This stuffed French bread makes for a great appetizer no matter the sport, though! 🙂 Thanks so much for commenting, my friend! Um 9 patties? This is why Americans have weight problems! At least grasshoppers are low in cholesterol. I’m with you on college sports. I’ll watch any and all of them, especially football and track. LOVE IT! Give me college over professional any day :). And while you’re at it, give me this bread! Allllll of it. Artichoke hearts are my all-time favorite food so I’m dying over this! Tell me about it, Kelsie! I can’t imagine even trying to eat that insanely huge burger. But to be fair, I wonder how many of those things they actually sell? I mean it sounds crazy, but I bet it’s not a common order. Either way…I’m with ya on college sports! And I should’ve known you’d be a big track girl since you’re from the Pacific Northwest. 🙂 Let’s make another loaf of this stuffed French bread and watch college sports all day, mmmk? Baseball? What is that? Did I answer your question, David? Lately, I’ve seen pretty many food ideas which at least sound weird (And Nutella pizza doesn’t sound too bad anymore!) People are being obsessed with mixing donuts with burgers and pizza with mac&cheese. I’m a pretty open-minded guy basically loving the combo of sweet&savory, but you’re right. Sometimes it’s just enough. It’s not about food experiments – it’s about food which isn’t delicious (Said Ben who’s combined pasta and chocolate and risotto with Irish cream hah). Honestly, I’d rather try some grasshoppers rather than that brisket donut! (But I won’t. Unless I can find grasshoppers with a lavender flavor). All right, let’s not talk about bad things. Let’s talk about the good ones – this delicious cheesy stuffed bread. Well, I have a better idea, though. Let’s make you send 1/2 half of this loaf to me, and we’ll discuss the bread later. But I have a feeling my review will be 99.9% positive! Hi David! MORE bread for me to stuff in my face! This is so much better than having to keep dipping something into a bowl; you just munch away! As for the foods now being offered at sporting events, do you know anyone who could eat a nine patty burger? And how does one go about eating it? Don’t think I would want to see someone try. Grassopers, uh NO! More bread is always more better, right, Dorothy?? 🙂 I’m all about some fun sports appetizers, and the Fall is a great time of the year for the sports season (I’m a college sports guy, so football now followed by basketball and baseball in the Spring)! Yeah, I can’t even imagine that 9 patty burger. I love a good burger, but 1 or maybe 2 patties is more than enough for me. 9!? I honestly doubt they sell that many…but speaking of selling out, can you believe they sell out of those grasshoppers? Ick. Not my thing at all! I’ll just stick with stuffed French bread instead! Thanks so much, my friend…I hope you and Gary have a great weekend ahead! 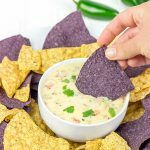 This sounds like my kind of appetizer dinner – I love spinach & artichoke dip, and I’m always up for French bread! On another note, I’m mildly grossed out by your ballgame food talk. A 9 patty burger is the epitome of what’s wrong with the standard American diet hahaha too excessive!! So I’m all about the breads lately, Neil! One of them was homemade, one was storebought. I can roll both ways…haha! And as far as picking, let’s just not pick one or the other. We can have stuffed French bread for dinner and then pull apart pumpkin bread for dessert! See, everyone wins there! 🙂 So you’ve actually had fried grasshoppers? I don’t think I’ve ever talked to someone who has actually eaten ’em. You’re braver than I am, my friend! Sounds like a great loaf to bring along on a picnic or barbeque. I am talking picnics and barbeques because it is almost summer here in South Africa. So I am really loving this recipe right now. Definitely saving and pinning to make this weekend! Oooo…good point, Ashika! I think of this bread as comfort food while watching Fall sports, but I forget that it’s opposite seasons on your side of the world. I do think this would be fun for a potluck picnic, though! 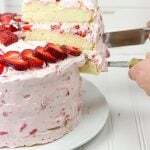 Folks could just grab a slice or two and keep on going! Thanks so much for stopping by, my friend! Ok, so I’m not a baseball fan….however, I would happily watch a game if that meant I got to eat this! Spinach artichoke dip is such a classic, but stuffing into a loaf of bread? Um, yes please! Talk about taking it to another level 😉 Have an awesome weekend, David! Haha! That’s about how I feel about baseball now, too, Dawn! It’s all about yummy gametime eats. (Of course, I’m not sure fried grasshoppers makes it onto my gametime menu!) Thanks so much, and I hope you have a great weekend ahead, too! Wow – I can completely see myself eating this for dinner too 🙂 I am not a big baseball fan, I actually don’t follow any sport on TV but I love food that accompanies games and are more than happy to make food for a football night. I very much enjoy those evenings and all the food and company that comes with it. Great to have another delicious recipe up my sleeve! Have a great weekend, David! Oh David! This bread sounds like a great idea! I love artichokes!! So this is totally for me!!! have a great weekend! That is some crazy food you tracked down. Nine parties? How do you even eat that? I could get behind this stuffed French bread, though. Yeah…tell me about it, Jeff. I kinda want to see someone figure out how to take a bite of a 9-patty burger. But then again, I kinda don’t want to see that. It might be like a trainwreck in slow motion. 🙂 But this stuffed French bread? Nice and easy to eat…and delicious, too! Bizarre baseball food aside, sign me up for this stuffed French bread! My kind of game day fare! I make something similar but I know I would love yours because of the added artichokes. The bread really looks yummy! Hey there, Karen! Don’t you just love that comfort food season is back again? Truthfully, I guess every season is comfort food season…it’s just that the food changes. But still. 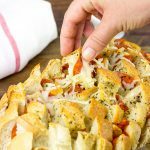 This stuffed bread is perfect for curling up on the couch with some sports (or a good movie) on in the background! 🙂 I hope it’s starting to sorta cool off for you down there! I’m not a baseball fan, but I am all about great food while my family watches the games! No grasshoppers in this house though! Just don’t think I can do that. I could definitely eat this artichoke stuffed french bread though! Yeah, I’m not so much a baseball fan, either, Kathy. Now football? That’s a different story…especially college football! And I’m right there with ya on the grasshoppers. Sounds unique enough for me to stop and just look, but that’s where the buck stops with me. Just looking is enough to satisfy my interest! Hah! Thanks so much, my friend! Can’t say that I am a baseball fan. 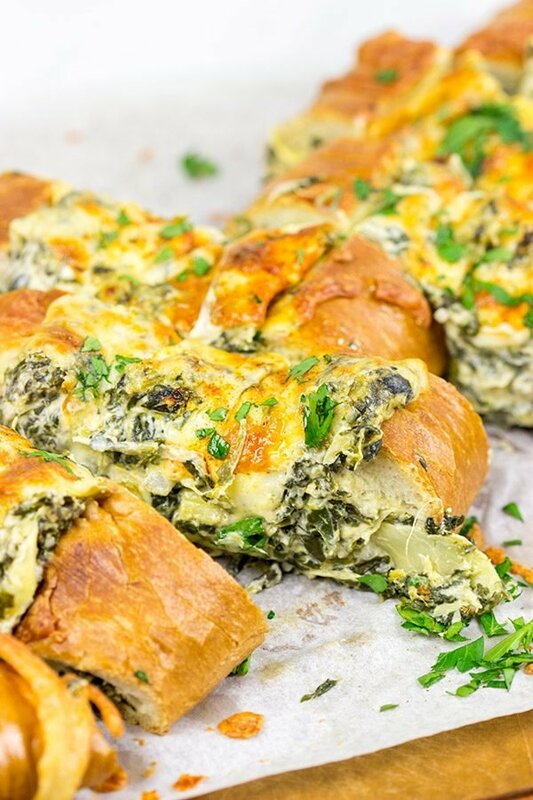 But this stuffed spinach artichoke stuffed French bread, I would be a big fan for this. I love food like this. Looks so yummy! I hear ya, Dawn! Baseball rarely (if ever) gets turned on in our house. (Well, college baseball does…but that’s a Spring sport.) Either way, this stuffed French bread makes for a yummy treat no matter what is on tv in the background! 🙂 Thanks so much, my friend! David, this sounds amazing! What a great idea, French Bread certainly beats plain ol’ crackers! And everyone’s favorite dip, right? And that list of stadium foods, really! I have to say, though, I’d possibly taste the crickets before I’d eat a 9-patty burger. Although, none of these are on my list. Hey there, Laura! I’m right there with ya on the French bread vs. crackers. I mean I do love a good cracker, but when you’re talking about stuffing a loaf of French bread with a creamy spinach artichoke dip? Yeah, that’s not even a contest! Ick. I don’t know if I could go with the grasshoppers. The 9-patty burger sounds a bit excessive (just a bit! ), but I think I’d go that route before I’d eat a grasshopper. In truth, I think I’d probably pass on both, though! I hope your week is going well, my friend! Other than roasting or braising artichokes I don’t usually cook with them but I love the taste. Especially on pizzas which means this french bread would bring tons of joy to my taste buds. This is the perfect game day recipe 🙂 You know I love football but I’m starting to get into baseball, it a fun game. I also enjoy watching curling, when does your league start? You know, I don’t cook with artichokes a ton, either, Mary. I do use ’em in spinach artichoke dip (and all sorts of other spinach artichoke creations), but I really should start using plain artichokes more. I have a really fun recipe for marinated artichokes…I should make that for the blog here sometime! So this stuffed French bread is excellent football food! Trust me on that one. 🙂 And the curling league should be starting right about now, but our club is having to make unexpected repairs on some of our equipment, so it’s delaying the start of our season a couple of weeks. I can’t wait until the repairs are done!